This dish is incredibly meaty, but doesn't contain any actual meat. 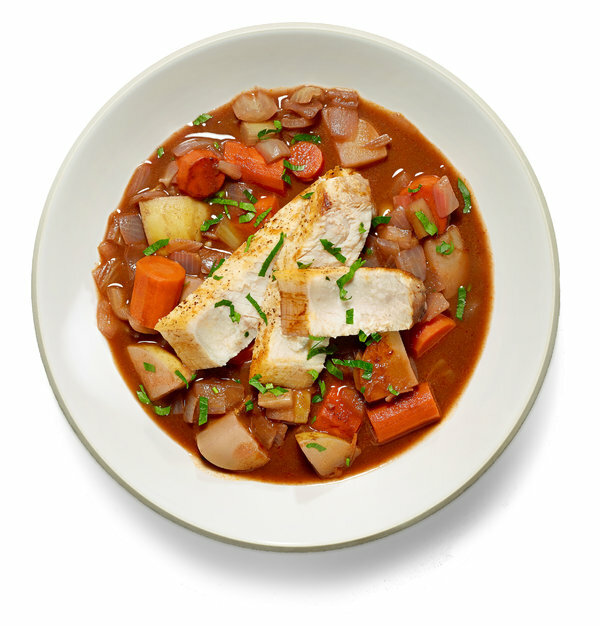 It’s fish braised like a pot roast, meaning seared, then simmered with vegetables in red wine and stock. To make this well, you need homemade stock; the canned stuff is overpoweringly bad. Beef or chicken stock will amplify the meatiness, but a quick flavorful fish stock (see below) also works wonderfully. 1. Put the olive oil in a Dutch oven over medium-high heat. When it is hot, sprinkle the fish with salt and pepper, and add it to the pot. Cook, undisturbed, until it is well browned, 5 or 6 minutes. (If you’re using halibut fillet, and it has skin, brown the nonskin side.) Transfer it to a plate, browned side up. 2. Add the onion, thyme, saffron, carrots, fennel and potatoes; sprinkle with salt and pepper. Cook, stirring occasionally until the onion begins to soften, about 5 minutes. Add the tomato paste and smoked paprika, and cook, stirring, until the tomato paste darkens a bit, 2 or 3 minutes. Add the wine, scraping up any browned bits from the bottom of the pot, and let it bubble away until it almost disappears. 3. Add the stock, bring to a boil and let it bubble vigorously until the liquid reduces by about a third, about 10 minutes. Adjust the heat so the mixture simmers; when the vegetables are nearly tender — about 10 minutes later — nestle the fish, browned side up, among the vegetables; keep the browned crust above the liquid. Cook, undisturbed, until the fish and vegetables are tender, 10 to 15 minutes. 4. Transfer the fish to a cutting board, and divide the vegetables among shallow bowls. Slice the fish and put it on top of the vegetables. Taste the cooking liquid, and adjust the seasoning; ladle it over all, garnish with the parsley and serve. Combine 1½ pounds white fish bones or cleaned heads, some roughly chopped carrot, celery and onion, 1 bay leaf, a crushed garlic clove, a few slices of lemon, 4 or 5 black peppercorns, ½ cup white wine and 5½ cups water. Bring almost to a boil, simmer for 15 minutes, and strain.